Sometimes a tree is a good place to sun one's self. 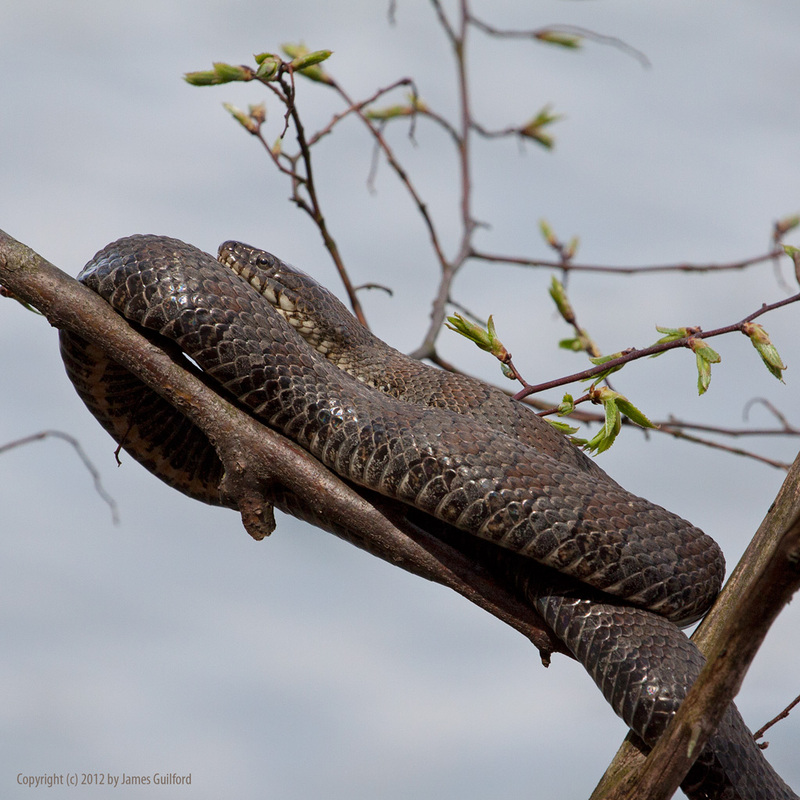 Northern Water Snake (Nerodia sipedon). It was an interesting Sunday. This morning we viewed the “Rembrandt in America” exhibit showing at the Cleveland Museum of Art. It’s amazing how good some 300+ year-old paintings can look! The exhibit also shows what can happen when a great artist becomes commercially successful in his own time. Works by or contributed to by Rembrandt’s workshop staff, students, and others can be and often have been attributed to the artist himself. The years and the treatment of the paintings by their successive owners have had huge influences upon what we see today. So what does “a Rembrandt” look like? Well… I know what some of them look like but left the show knowing that looks can be deceiving. After lunch we went home, changed to suitable clothes, and headed to Hinckley Lake to take advantage of the bright and warm (now 78 degrees F) afternoon. I carried about 20 pounds of DSLR camera gear. She Who Must Be Obeyed carried her new, lightweight Canon one-piece camera with an extraordinary built-in zoom that can range from macro to 800 mm equivalent telephoto! Walking along we merrily shot photos of flowers and plants, water and bark. Then I spotted a big, dark bullfrog resting upon a piece of wood at water’s edge. A few photos. Then She said, “look!” I looked where she was pointing and, to my surprise, saw a nice-sized Northern Water Snake (Nerodia sipedon) coiled up sunning itself… about six feet above the water in a tree! The snake posed patiently for photos and when we’d had enough, we moved on. Snake stayed put. Not much farther along we spotted another water snake suspended in the branches. Some way farther, another though this one stretched out along a log jutting from the water. We also encountered one large and one baby garter snake, though they were not nearly so impressive as the tree-climbers. Still in all, it was a fine day looking at old paintings and shiny new snakes. I’d need a good zoom to get this close to a snake! Which “one-piece” Canon does your wife have? Hi Emjay! I was using a 70 – 200mm zoom, and not at its extreme, so the wider shot you see here didn’t take a very long zoom. She has a nice, new Canon PowerShot SX40HS. She’s got a bit of a learning curve ahead but this first batch of nature shots was very good indeed and that long zoom of hers was extraordinary! Up to 800mm equivalent! I have a Canon Powershot SX30IS which has a similar zoom but I don’t find the photos very sharp – especially in lower light. Although I’ve had it for a year+ I haven’t used it very much as it doesn’t fit in my daily handbags like my SX200is. I must get a bigger bag!